Getting a virtual “foot in the door” - Ekonovac - A Digital Marketing Agency | IIAS - International Internet Advertising Services Inc.
With new media exploding all around us, it’s easy to get caught up in the fad of the day, and to totally forget about marketing basics. Back in the day, if you wanted to sell home appliances, you targeted women who worked in the home. If you could get your “foot in the door” to keep it open long enough to make your initial pitch, your chances of making a sale went way, way up. The first step in marketing has, and always will be, get their attention. Give them some reason to afford you just a few more minutes, a few more seconds of their time. Find some way to start the conversation, start an interaction – otherwise, you never get to step two, which is when you start laying out the benefits and features of your product or service. Now fast forward from the door to door salesmen of yesteryear to 2013. You’re not likely to bump into anyone schlepping a vacuum cleaner around your neighbourhood. 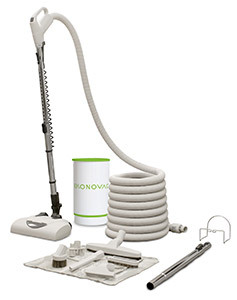 If you want to sell a vacuum cleaner, you build a website – easy, peasy. Well, not quite. If you type “vacuum cleaner” into Google, you get more than 47 million results. No kidding – 47 million. So, what’s the modern day version of getting your foot in the door? The hype jockeys will tell you to Tweet until you’re blue in the face; to “engage your target market” with a Facebook page; to hire a flash mob to do a Gangnam Style dance featuring your product at the mall. I’m not going to say those are bad ideas in general, but if I’m trying to sell vacuum cleaners? Nope, not the way I’d go. While marketing basics still reign, the sales path has clearly changed. It’s a total waste of time to flog something that the flogees don’t need or want right now. It’s the customer who sets the timing. When they decide that they want to buy a vacuum cleaner, you’ve got to be ready. Good SEO will get you on to the first page or two of the search engines. Great – but is that your foot in the door? No. That’s just your map of the neighbourhood. The time to put your virtual foot in the door is in those first few seconds after they land on your website. They’ve opened the door, and you have one, very short, opportunity to put your best foot forward. You’ve got to do it fast. So, why am I talking about selling vacuum cleaners? Because we just launched Ekonovac.com. It’s an awesome product, but I want you to go to the site to see what we came up with: to hold the customer’s attention for just a few more seconds; to start an interaction, and just at the right time. We’re not asking them to follow us for months; we’re not asking them to post pictures of their most memorable vacuuming moment. We just want them to stay on the site for a few more seconds, so we can start the pitch. Check it out. 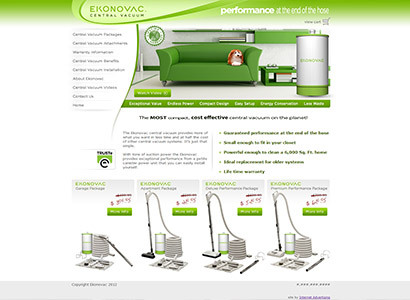 Ekonovac.com.